Japan is known as a quite expensive country to visit. Definitely don’t let this stop you from going to this amazing, beautiful country. There are ways to budget your trip, such as looking for affordable accommodations (try Airbnb when in bigger cities), restaurants and activities. Most Japanese cities also have enough fun activities that are completely free. If you’re going to Osaka and want to do a lot of exploring, without spending a single penny, this post is for you! We asked fellow travel bloggers who’ve been to Osaka to share their favourite free things to do in Osaka. Below you can find activities in Osaka that are worth doing and completely free! Dotonbori runs parallel to the Dotonbori-gawa canal. Of course it’s completely free, and most importantly interesting, to walk around this area during the day or during the night. Experience this vibrant place with tons of shops, restaurants, bill boards and crazy signs. Especially during the nighttime the streets here come alive with all the lights and neon signs. Even if you’re not looking to spend any money in the shops or restaurants, it’s just worth to walk around and take it all in. But if you’re happen to looking for local food, it’s the right area to be. 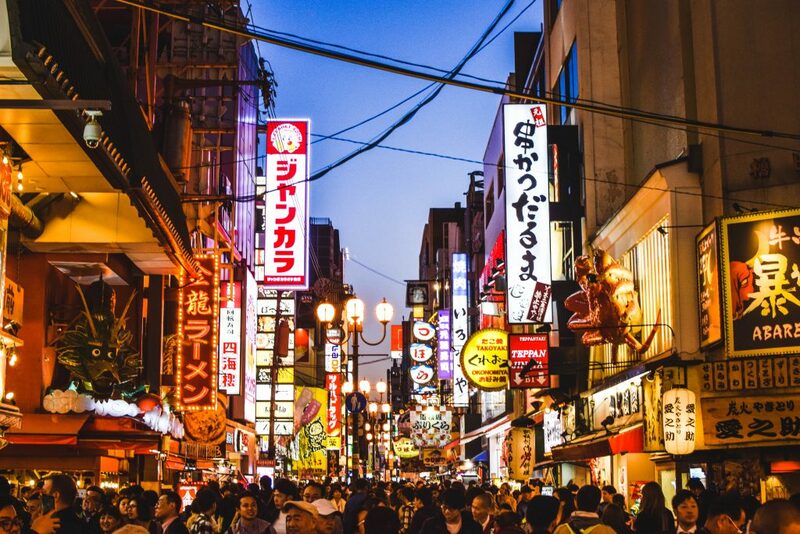 Get amazing ramen, takoyaki balls or any other Japanese food you can think of in Dotonbori! Shinsekai is a remarkable place where you can find big quirky advertising props, like the famous blowfish latern you see on the photo above this text. 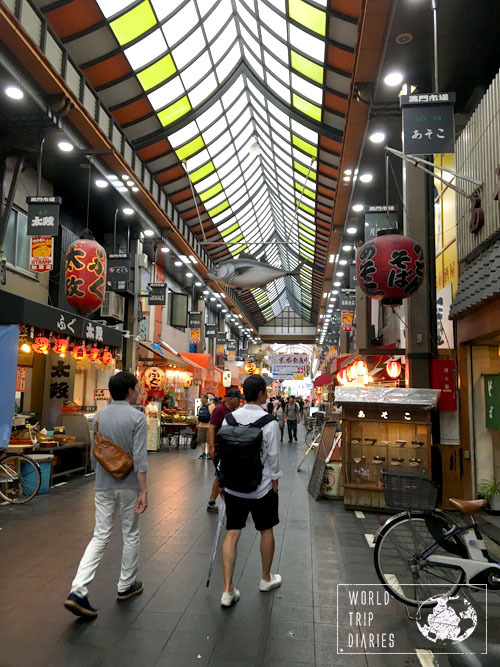 There are plenty of 3D models of various food and sea creatures in Shinsekai. It’s really an interesting place to visit and a great opportunity to take some awesome photos. During our visit Shinsekai was less crowded than Dotonbori. Plus, it’s only a walk away from Dotonbori, so you can easily combine the two. 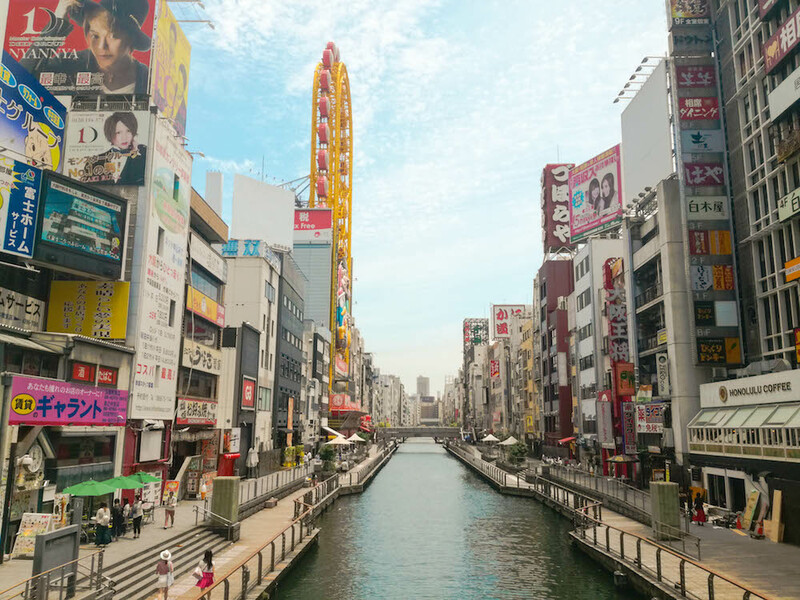 Probably one of the most popular places in Osaka is the Ebisu Bridge, previously called Shinsaibashi Bridge, which you can find in the Minami Area not far from the Shinsekai and Dotonbori Area. This famous bridge crosses the Dotonbori Canal which gives its name to the neighbouring area. Surrounded by big bright billboards and neon advertisements, this amazing part of Osaka is truly unique. The most famous of those advertisements that you can see from here is the Glico Man which is 33m tall and shows a victory pose. Hundreds of tourists are coming to the Ebisu Bridge in Minami every day to take a picture with this popular billboard. If you are looking for a great shopping experience as well as a fun night out, Minami is the right place to go to! Another great thing you can find there is different kinds of yummy food. Written by Vicki of Vickiviaja. If you want to get away from the hustle and bustle of Osaka’s city center, visit Minoo Park where you can find a forested, quiet valley. It’s a great place if you’re looking for a bit of peace and quiet and need some fresh air. Here you can do the easy hike for three kilometers alongside the Minoo River. 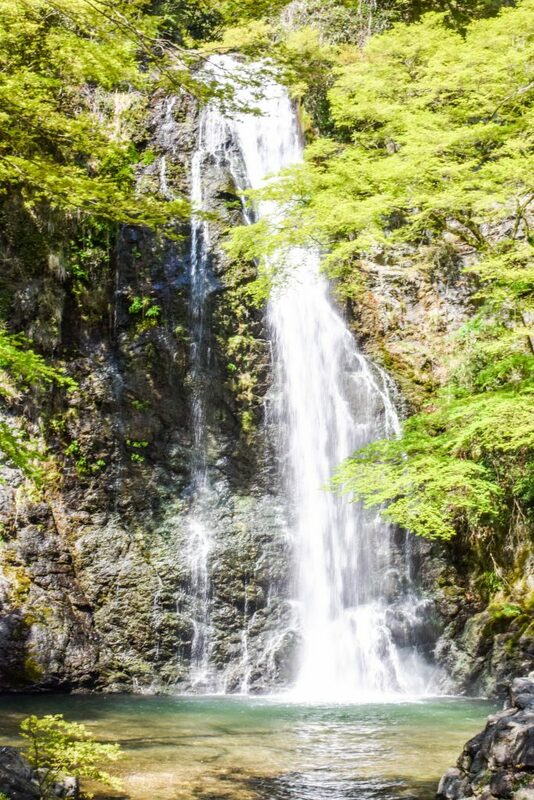 It leads to the Minoo Waterfall that you can see on the photo above this text. The hike takes about 30-40 minutes (one-way) and the elevation is not steep at all. It’s really just a (free) walk in the park! 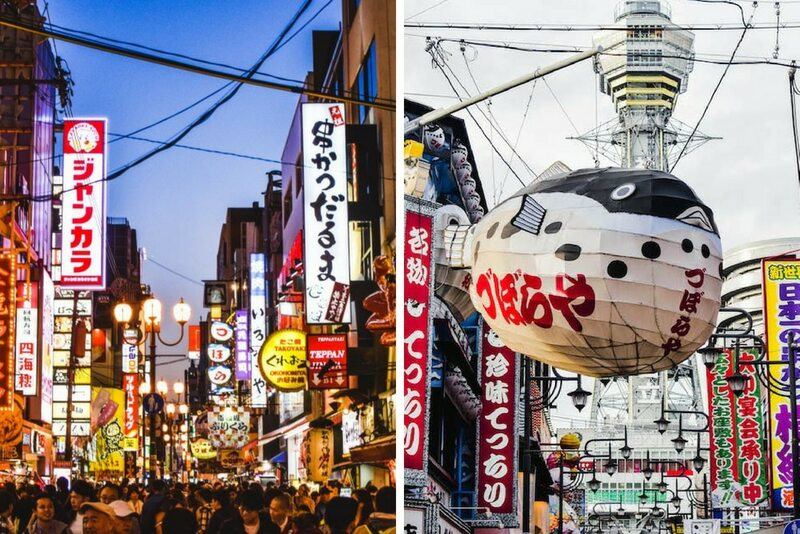 Read more about Dotonbori, Shinsekai and Minoo Park in our short guide to Osaka. Amerika-Mura is a cool neighboorhood that is famous for cutting edge fashion and shops. It’s known as Amerika-Mura due to the small Statue of Liberty statue that you’ll find here. This neighborhood is considered to be the epicenter of Japanese Youth Culture with numerous shops dedicated the next up and coming fashion trends as well as the famous kawaii fashion style. It neighbors the famous Dotonbori area, which makes an easy place to visit if you’re exploring the main attractions of Osaka. If you’re interested in admiring the amazing outfits worn by the fashionistas that you’ll see here, which are unlike what you’ll see in many other parts of Japan, consider coming to Triangle Park on a weekend afternoon. 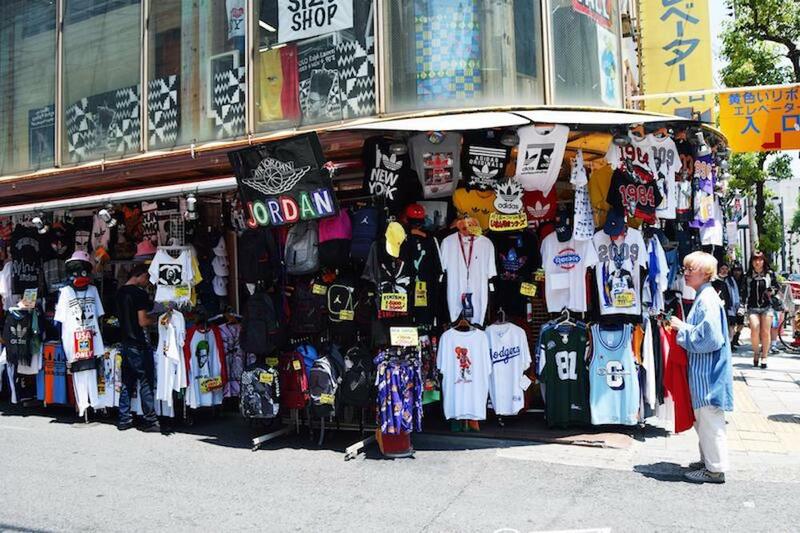 Even if you’re on a budget, it’s fun stopping into the various shops in the area, which is the perfect place to pick up a unique souvenir and/or fashion accessory. It’s not particularly well-known, but Osaka is actually home to the third-largest tomb in the world (after the Mausoleum of the First Qin Emperor in China and the Great Pyramid of Giza in Egypt). It’s called the Tomb of Emperor Nintoku and it’s almost 500 metres long and 300 metres wide! It was built about 1500 years ago, when Osaka was the centre of Japan’s politics and economy. 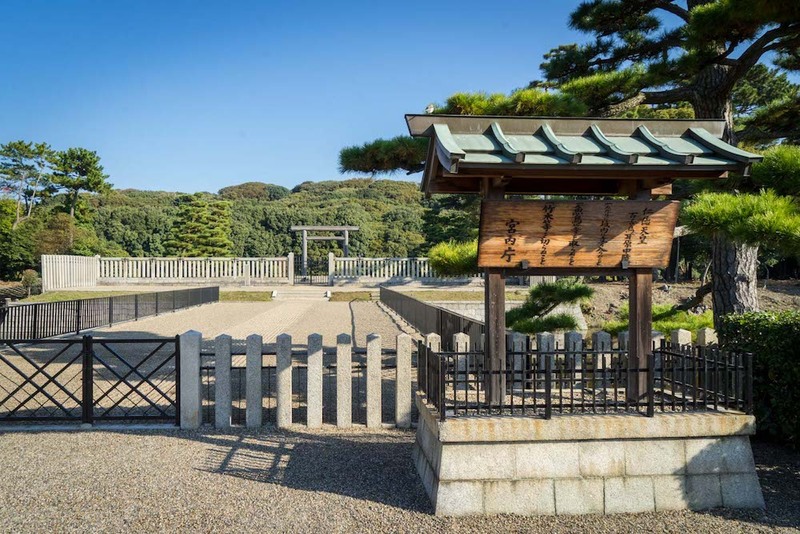 Admission for Tomb of Emperor Nintoku is completely free! Many of the emperors and important figures were buried here in these special tombs called ‘kofun’ – but Emperor Nontoku’s was by far the largest. From above, the tomb looks shaped like a keyhole and it is effectively an island because of the large moat around it. The island is a large hill that is now covered in trees, although it would just have been grass back in the day. Nobody is allowed to go onto the island but you can see the tomb from the pathway that goes around the moat. There is also a lot of information on boards that explain the history of the kofun tombs and show you where you can see some other ones nearby. Written by Michael Turtle of Time Travel Turtle. 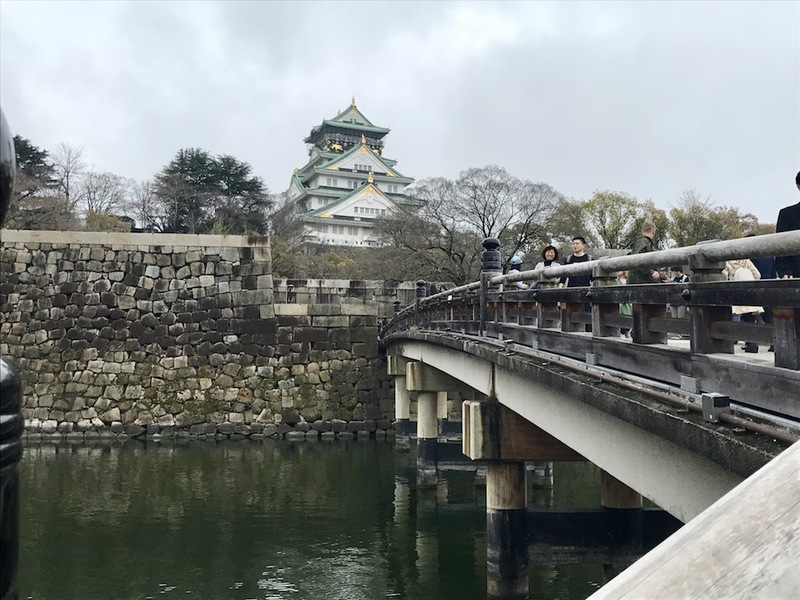 One of the best free activities in Osaka is visiting the famous and beautiful Osaka Castle. Built in the 14th-century, this Asian castle has been rebuilt and restored to excellent condition. Surrounded by a water moat and the Nishinomaru gardens, the castle is great because so many local families and tourists fill the parks on weekends for picnics and festival food, including takoyaki octopus balls popular in this region of Japan. The best time to visit is in April when the sakura cherry blossoms make the castle magical. In fall, the tree colors on the leaves are a dramatic contrast to the green-peaked roof and gold detail of the castle. Visiting the castle grounds and gardens is entirely free. If you go inside the castle to get a view from the top, the entrance fee is 600 yen and it is open daily from 9 am – 5 pm. You can easily spend a half-day here enjoying a picnic, taking pictures, and walking the castle grounds. Written by Cerise Roth-Vinson of Enchanted Vagabond. One of the most unique places in Osaka is the Kuromon Market, which is luckily completely free to visit. It’s full of the most incredible stalls, varying from live fish to fancy fruits to dollar shop things, and even some artisan souvenir places. That’s the place where we first saw the real wasabi root, had some incredible Ichigo daifuku (Japanese rice dough with a strawberry in the middle), and the cheapest, yet best Japanese fried chicken (kara-age) and takoyaki (little round dough balls with a little piece of octopus)! If you visit it during lunchtime, you’ll have an enormous array of food to choose from, but if you miss it, you’ll have missed most of the little restaurants, with the best food. Don’t be discouraged, it’s still very worth the visit as some of the things there can’t be seen anywhere else in Japan! Written by Thais Saito of World Trip Diaries. Japan is the birthplace of instant noodles. It was here, near Osaka, in 1958 that the world’s first instant noodle was made by Momofuku Ando. He went on to invent the cup or pot noodle in 1971. How can you, knowing that, resist a museum dedicated to the humble noodle. The museum is free to visit and here you’ll learn about the history of instant noodles, plus check out the variety of flavors and packaging throughout the years and the world as you walk through the noodle time tunnel. There are of course noodles to buy and eat and even better, you can do to the Cup Noodle Factory, and make your own cup noodle. It’s a mere 300 yen, but amazing fun for kids of all ages (says the 47-year-old without kids). You design your pot, with pens and crayons, then head off to the factory to decide on your flavorings too. You even get to turn the handle that puts the dried noodles in the cup. 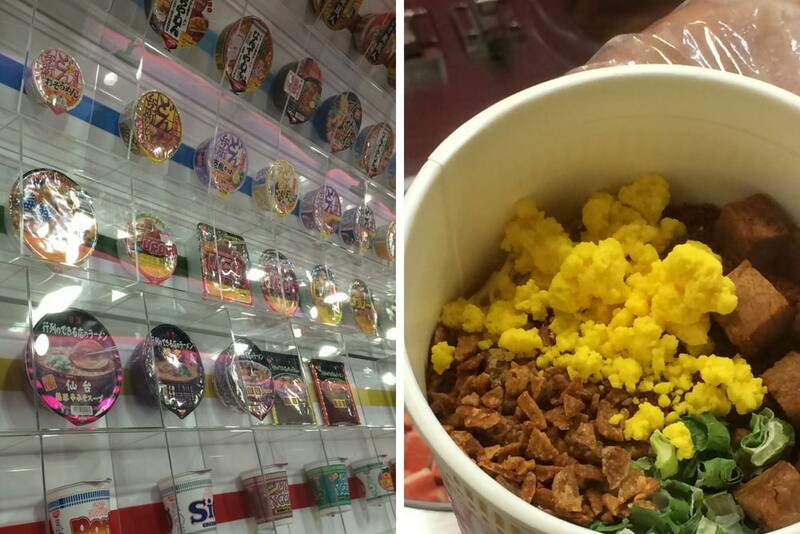 Your own personal cup noodle is carefully wrapped up in a presentation bag for you to take away. So you get to take your dinner home with you! Bargain! It’s a fabulous experience and I’d go again in a heartbeat – because I have to say MY cup noodle might just have been one of the BEST EVER! Written by Sarah Carter of A Social Nomad. Sumiyoshi Taisha is one of the more “hidden gems” of Osaka. It’s often left off of many Osaka itineraries, but it’s definitely worth a visit. Probably my favorite part of Sumiyoshi Taisha is the big red bridge that leads to the main shrine grounds. It crosses over a decent sized pond surrounded by beautiful gardens. Once inside, you can appreciate the buildings of the main shrine grounds. It’s one of Japan’s oldest shrines and one of three shrines that are purely Japanese architecture (free from influence of other Asian countries). If you’re looking to truly experience Japanese culture, you can even ring the bell and say a prayer to the Sumiyoshi Sanjin, the Shinto gods enshrined there. 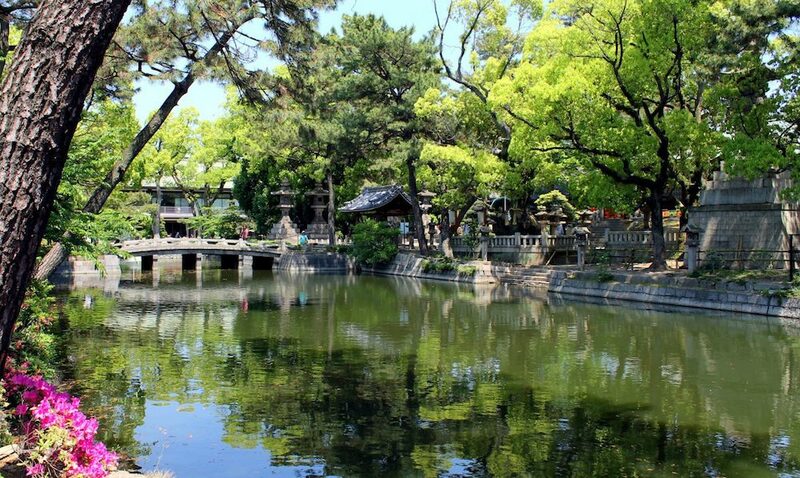 Whether you’re interested in architecture, mythology, beautiful scenery, or just something to do for free, everyone will likely enjoy a visit to Sumiyoshi Taisha! Written by Kiyoko of Footsteps of a Dreamer. 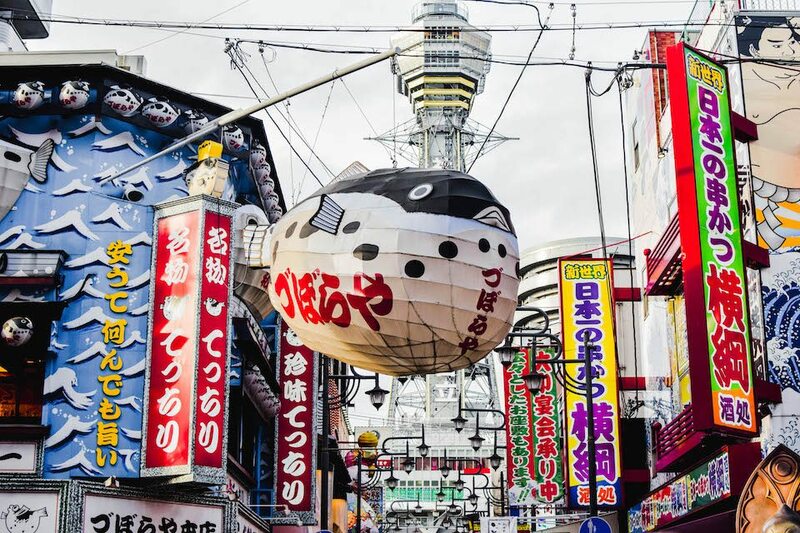 The area surrounding Dotonbori is a complete sensory delight – from the smells and tastes of delicious street food to the futuristic sounds of Pachinko parlours in the bustling city centre. Your eyes will be completely distracted by the seemingly endless sight of vibrant signage and oversized sea creatures on the storefronts. It’s always intuitive to look up towards these things, but don’t forget to look down, too! For those of you who love hunting for attention to detail, here’s another free activity to add to your Osaka itinerary. 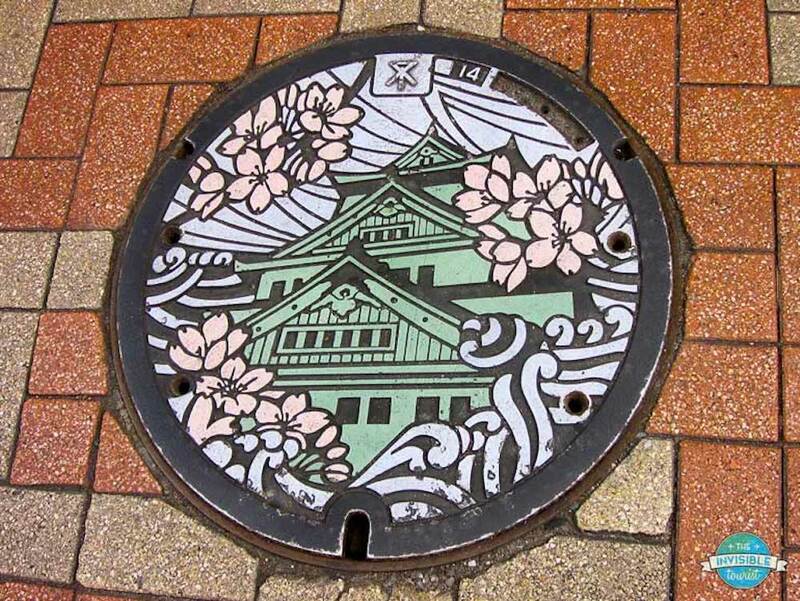 It’s no surprise in Japan that a usually mundane item such as a manhole cover (or drain cover) could be transformed into something so artistically stunning. As the city’s biggest icon, Osaka Castle proudly adorns the colourful manhole covers dotted throughout the streets. It’s a fun challenge to see how many you can hunt down or stumble upon, quite literally! Written by Alyse of The Invisible Tourist. Through the years, Osaka had been known either as a city of merchants or the nation’s kitchen. However, there is a different, more gentle, side to this bustling metropolis. Osaka, located at the mouth of Odo River on Osaka Bay, is the city defined by a myriad of waterways. When night falls, the city lights mirrored by the water transform even most uninspiring buildings into a magical world. Abstract reflections add an avant-garde angle to the cityscape. Strolling around Nakanoshima island is my favorite way to experience it. Located in the Kita-ku area, it is surprisingly quiet and peaceful in comparison to a maddening color explosion of Dotonbori. After dark, with salarymen and women gone, the island gets divided between exercise buffs and romantic couples. There is also an added bonus. If you like dogs, that’s where you find a few ears to scratch. 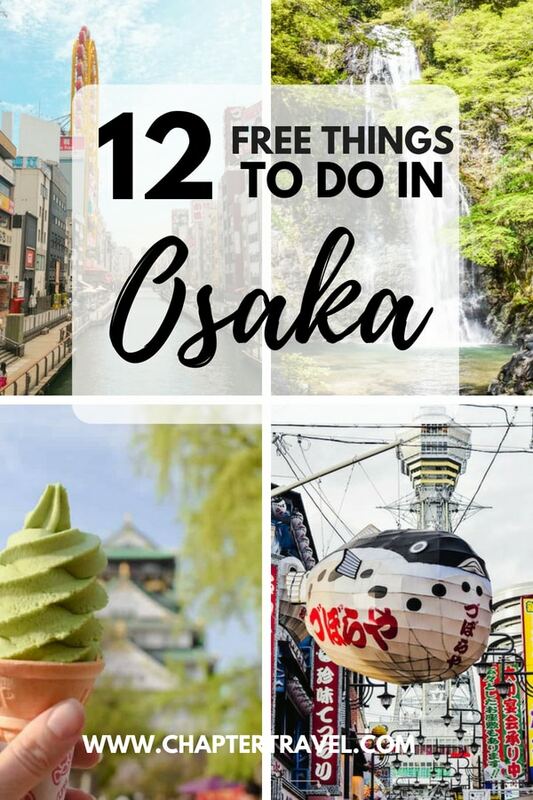 These were 12 free things to do in Osaka! Be sure to read our short guide to Osaka for more useful information, such as more fun things to do and a great hotel recommendation where you can stay during your time in Osaka. I think my favourite is on the edge of Osaka, the Tiger temple on Shigi-san near Tennoji. I love that crazy place. Thanks for this list! Japan is high on my travel list at the moment. I love off-the-beaten path destinations so Sumiyoshi Taisha looks perfect! I loved Osaka! I wasn’t able to cross all these off my list. Where was that beautiful waterfall? I love dotonbori! Really enjoyed reading about free things in Osaka. You nailed it – Japan is a pretty expensive country. Hence, indulging in certain activities without putting additional strain on a travel budget feel awesome. I had a good laugh reading about manholes. It sounds perfectly reasonable to those who ever wandered Osaka’s streets, they do look like works of art. 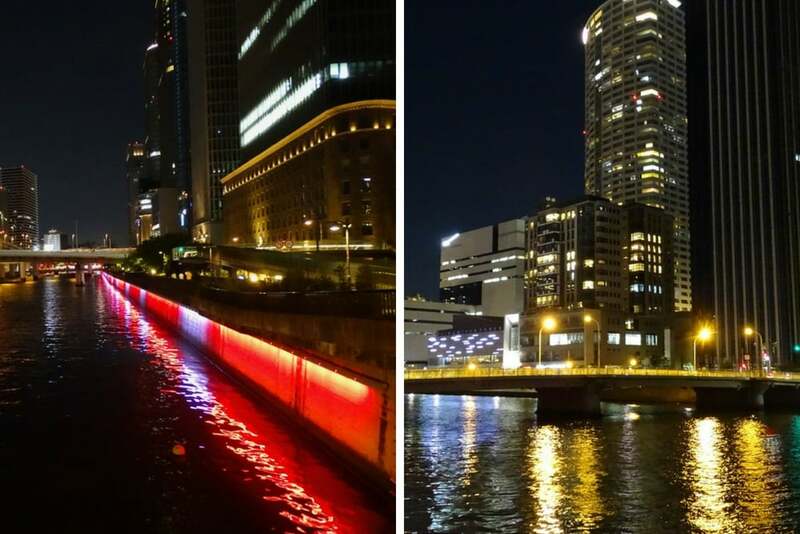 Last but not least, thank you very much for including my favorite escape from the summer heat – a night walk along the water.